AP Police Constable Mains Hall Tickets download 2019 slprb.ap.gov.in PC Warder Firemen FWE Admit Card . 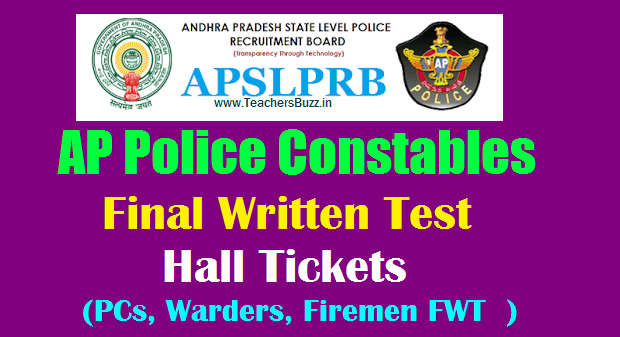 Andhra Pradesh Police Constable Mains Admit Card 2019 SLPRB AP PC FWE Hall Ticket 2019 @ slprb.ap.gov.in AP Police Constables FWE Hall tickets Final Written Test Admit Cards 2019 for PCs, Warders, Firemen FWT Hall tickets 2019 download : Downloading of Final Written Test Hall Tickets link has been activated at AP Police Recruitment Board Official website. AP Police Recruitmemt Board Announced to Conduct AP Police Constable Mains Exam on 17th March 2019 from Morning 10AM to Afternoon 01PM. The said Examination will be held at Visakhapatnam, Kakinada, Guntur, Kumool and Tirupati. Candidates who are qualified in PMT and PET may download their AP PC Hall Tickets from 06-03-2019 to 16-03-2019 from the website “slprb.ap.gov.in”. State Level Police Recruitment Board, Andhra Pradesh, Mangalagiri. Date:23-02-2019. Recruitment to the posts of SCT PCs (Civil) (Men & Women), SCT PCs (AR) (Men & Women), SC1 PCs (A15P) (Men) in Police Dept, Warder (Men & Women) in Prisons & Correctional Services Dept., and Firemen (Men) in A.P. Fire & Emergency Services Department was notified vide Notification No.215/ R&T/ Real/ 2018, dt 12-11-2018. The Physical Measurements Test and Physical Efficiency Test for the said posts are being conducted from 07-02-2019 onwards at 13 District Hqrs. Final Written Examination for the above posts will be held on 17-03-2019. The Examination consists of one paper (Objective Type) for which all candidates have to appear on 17-03-2019 from 10.00 AM to 01.00 PM. The said Examination will be held at Visakhapatnam, Kakinada, Guntur, Kurnool and Tirupati. Candidates who are qualified in PMT and PET may download their Hall Tickets from 06-03-2019 to 16-03-2019/08.00 PM from the website "slprb.ap.gov.in". In case of any difficulty in downloading Hall Ticket, such candidates may contact Help Line No.9441450639 or send email to: "mail-slprb@ap.gov.in". Step 3. In this page, Click on the link of "SCT PCs (Civil) (Men & Women), SCT PCs (AR) (Men & Women), SCT PCs (APSP) (Men) in Police Dept., Warder (Men & Women) in Prisons & Correctional Services Dept., and Firemen (Men) "
Step 5: Then "FWE Hall ticket Download" page will be shown. Candidates who are qualified in PMT and PET may download their Hall Tickets from 06-03-2019 to 16-03-2019/08.00 PM from the following link. AP Police Constables FWE (Mains) Hall tickets 2019 download FWT/ Final Written Test Admit Cards 2019 at slprb.ap.gov.in AP Police Recruitmemt Board Announced to Conduct AP Police Constable Mains Exam on 17th March 2019 from Morning 10AM to Afternoon 01PM. AP Police Constables FWE (Mains) Hall tickets 2019 download FWT/ Final Written Test Admit Cards 2019 at slprb.ap.gov.in The said Examination will be held at Visakhapatnam, Kakinada, Guntur, Kumool and Tirupati. Candidates who are qualified in PMT and PET may download their AP PC Hall Tickets from 06-03-2019 to 16-03-2019/08.00 PM from the website slprb.ap.gov.in .